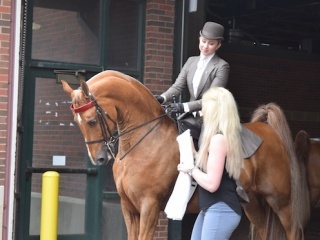 Kelly Hulse.When she took over heading up the Saddle Seat discipline of Stephens College’s equestrian program in July 2014, Kelly Hulse was already an Adjunct Professor there since the Fall of 2013. After Stephens College advertised in a national search for the full-time position, Adjunct Professor Kelly applied. Following the review of all the applicants, the school’s selection committee offered the job to Kelly. 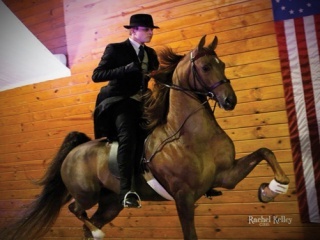 In her Stephens job, Kelly teaches “three riding/driving classes, currently using 16 American Saddlebreds, Hackneys, and Morgans,” she said in our December interview. “I never have more than eight student riders/drivers in a class. I usually break down my classes into groups so I can spend more one-on-one time with the combinations,” she said. Kelly also does classroom lectures. 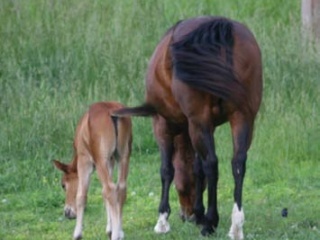 “I currently teach the Stable Management class,” she said. 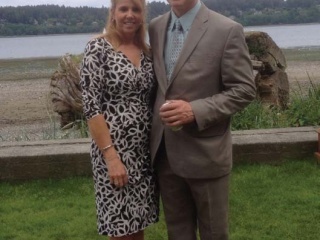 Her reference to “running and operating our own business” comes from Kelly’s role as Mrs. Mark Hulse. 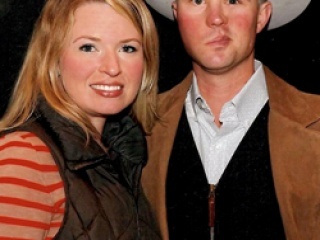 She married horseman Mark in October 1990. 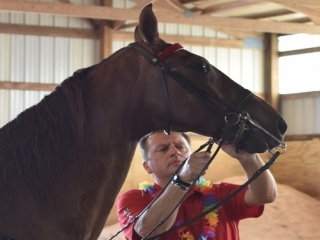 Since their marriage nearly 25 years ago, Kelly has served “as owner, trainer, instructor, breeder, and business manager for Mark Hulse Stables,” which is located in New Bloomfield, Missouri, just across the Missouri River from the State Capitol in Jefferson City. Now, with her full-time job at Stephens, Kelly said, “We are in the process of moving to Columbia and selling our farm. Mark is currently working at Middendorf Farms so we could downsize our operation with me now working full time” in Columbia. 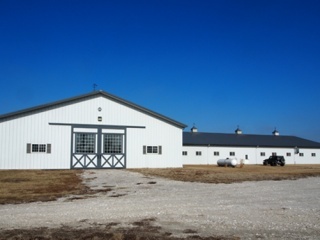 The farm of long-time show horse people, Sydney and Garland Middendorf, is in nearby Harrisburg, which is a short drive from Columbia in eastern Boone County. Another course Kelly teaches is Methods of Teaching. Kelly meets with those in her Horse Keeper class three days a week. “I assigned each student in this class a string of horses at the beginning of the semester. Their strings include horses from all the disciplines. 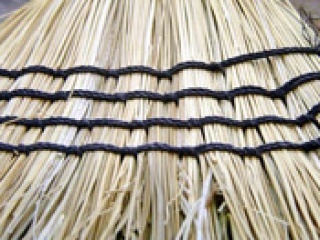 This is a great learning experience for the ladies as each is dealing with the daily care of horses inside her string. 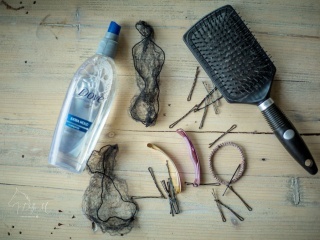 This includes management of health, exercise, grooming, and general all around responsibilities for each individual to her string for the entire semester. 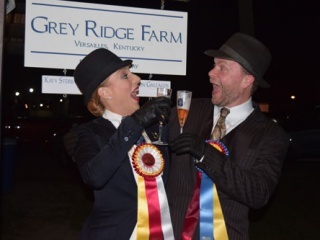 This is an upper level course and the girls must be fully committed to their horses,” Kelly emphasized. What is a typical work day for Kelly? Stephens College itself is the second-oldest women’s college in the United States. It was originally opened in 1833 as the Columbia Female Academy. In 1855, it was re-named the Columbia Female Baptist Academy. Stephens College got its current name in 1870 after James L. Stephens endowed $20,000 to the school. 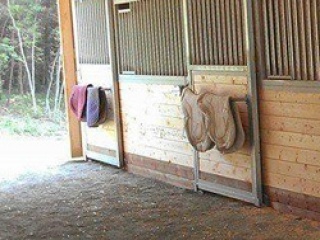 Today, the school is continuing to upgrade and expand its equestrian work. 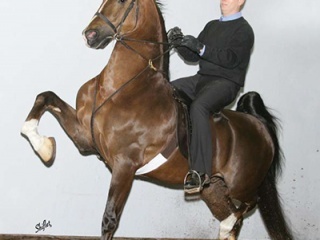 Starting this month, January 2015, Kelly teaches a new course — Saddle Seat Training Techniques. “I am super excited about this new course Stephens is letting me teach,” Kelly told me. Another class Kelly teaches is Horse Show Preparation. Kelly knows first-hand how Stephens approaches its students’ education. She entered Stephens in 1982. 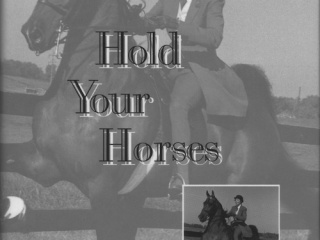 In 1984, Kelly served as the Head Instructor for Stephens’ Saddle Seat Summer Camp. In 1985, she “began an internship at Barry Marshall Stables in Scottsdale, Arizona.” From there, she “went to work for Kelwood Stables from 1986 to 1987” in Oregon City, Oregon. This was a return to “home” for Kelly. 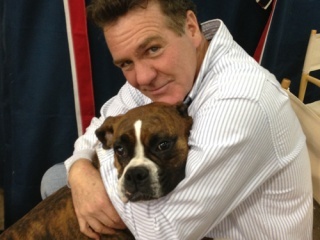 Earlier in her life, Kelly got “hooked immediately on horses” with her first horse that her parents bought for her “after my dad was transferred to Scott Air Force Base in Illinois from Washington, D.C. where he had worked in the Pentagon for six years.” They actually lived in the D.C. suburb of Clinton, Maryland. Before Kelly’s father was transferred to D.C., he was stationed in Taipei, Taiwan. My dad met my mom in Mississippi and I was born in Denver, Colorado. While a baby, we moved to Taipei. My mom tells me that before I spoke English, I spoke Taiwanese learned from our maid named Kay. I do not remember any of it,” Kelly noted. 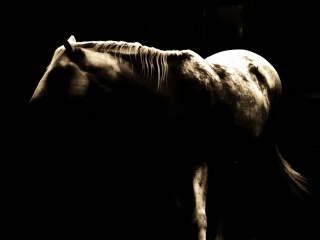 Over the years, “I grew more involved with horses and my parents were very supportive of me. They purchased several horses for me throughout the years. We attended several shows but the highlight of the year was always to go as a family down to Arizona for the Phoenix A to Z show each Spring,” Kelly said. 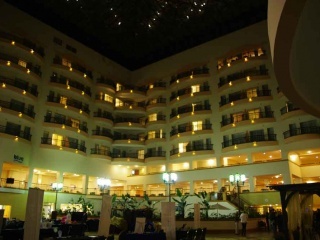 In 1989, Kelly became the instructor at Sea Beauty Farm in Chesterfield, Missouri, where she worked for a year before getting married in 1990. 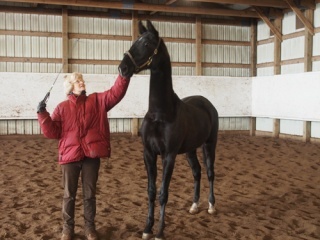 She is a licensed Large R USEF judge in Saddle Seat Equitation, Saddlebreds, Roadsters, Hackneys, and Friesians. 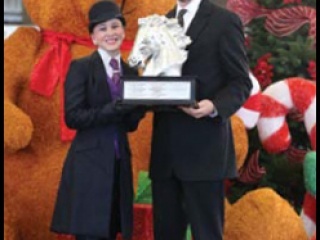 Kelly instructed Scott Pisarik, the 2003 & 2004 Missouri Horse Shows Association Saddle Seat Medallion Finals Champion. 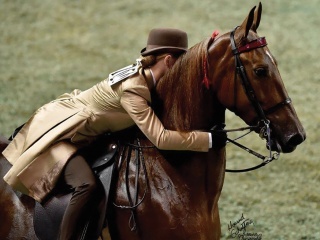 She was the instructor of Brittany Rock, the 2004 & 2005 National UPHA Exceptional Challenge National Champion. 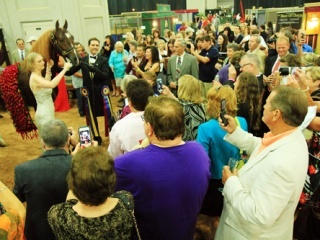 In 2006 and 2009, Kelly was honored as the Missouri Horse Shows Association’s Horse Person of the Year. Yes, she did win it twice. From 2003-2010, Kelly was a board member of the Missouri Horse Shows Association. 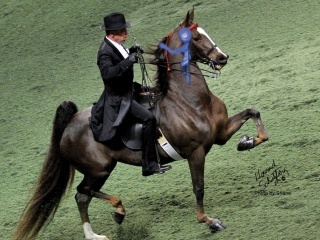 In 2010, Kelly trained and rode WC El Matrero, the Ladies Five-Gaited Gelding World’s Championship. 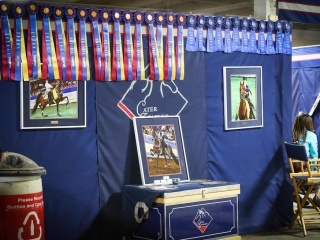 This past Fall, Kelly guided Stephens riders in their show efforts at the American Royal National Horse Show in Kansas City, Missouri, at the Kemper Arena. Also at the Royal last fall, Kelly rode in the annual donkey races. 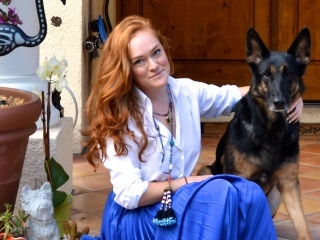 Another horse-loving girl in Kelly’s life is 21-year-old daughter Megan. “Mark and I have an amazing daughter who currently is a junior at the Missouri University of Science and Technology in Rolla, Missouri. She is majoring in Petroleum Engineering. Megan has ridden all of her life and loves showing. 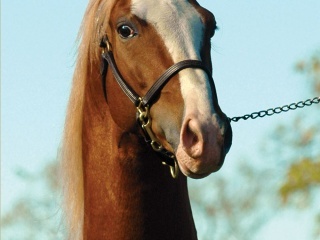 Her favorite horse of all time was actually a Stephens College horse, Callaway’s Golden Wonder, AKA Happy. 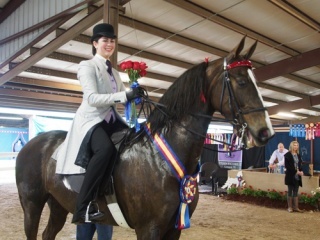 Megan showed her with much success in Juvenile Five-Gaited. Happy is retired now and living at our farm in foal to Callaway’s The Gipper.” They are expecting the colt in late May. 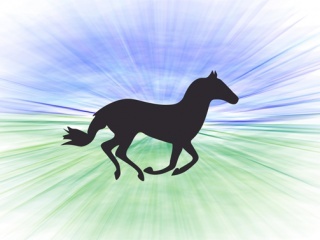 Stephens offers the following degrees: (1) Bachelor of Science in Equestrian Studies: Business Management; (2) Bachelor of Science in Equestrian Studies: Equestrian Education; and (3) a Bachelor of Science in Equestrian Science. “And there are many related minors from which to choose,” Kelly pointed out. 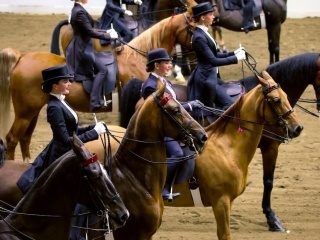 The equestrian program is just one of many under the leadership of the Stephens College President Dr. Dianne Lynch who accepted the post in June 2009. She became the 24th President of the school. Educating women since 1833, the school only got its first female President in 1983 with the selection of Patsy Sampson. Hunt Seat is currently headed by Sara Linde-Patel. Previous instructors over the past few years have been Deborah Booker and Michelle Smith. Reining is under the direction currently of Jim Dudley. Western, currently under the direction of Karen Craighead, was directed previously by these three instructors: Sharon Ward, Amy Doran, and Becky Clervi. 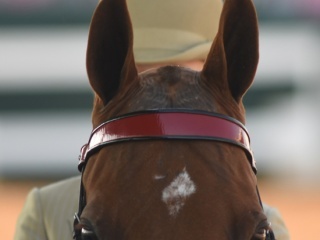 Over Stephens’ four equestrian disciplines is a Program Coordinator. This job was held many years back by Deborah Booker, then Michele Smith, Ellen Beard, Becky Clervi, and now Sara Linde-Patel. Her knowledge ranges from training and teaching Hunter/Jumpers to assisting at Prospering Farm, a top Hunter/Jumper and breeding facility in Prosper, Texas just north of Dallas. As assistant trainer, I also helped manage various aspects of the lesson program. I was also a veterinarian technician for a small and large animal practice in Little Rock, Arkansas. I have been successful locally, as well as on the “A” circuit, as a coach and competitor,” Sara told me. Some of “our new changes will move the program forward to create well-rounded young professional ladies. 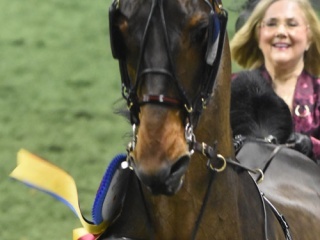 With new assessment programs in place as well, I feel there will be a new emphasis on helping our ladies transition from amateur owners to competent leading professionals in the equine industry. This is just another example of how well trained our ladies are when they graduate,” Kelly said. You can contact her by writing: Kelly Hulse, Saddle Seat Instructor, Stephens College, Equestrian Studies Program, 1200 East Broadway, Columbia, MO 65215 or call her: (cell) 573-590-2557 or via email: khulse@stephens.edu.